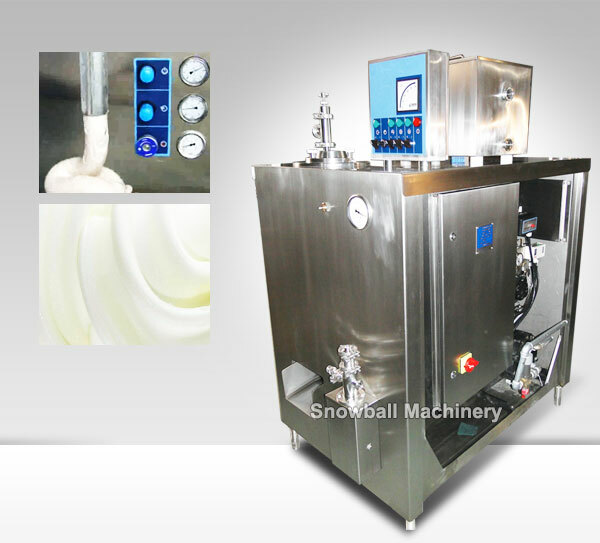 Ice Cream Continue Freezer (Ice Cream Continuous Freezing Machine) is used in ice cream production. It blend the slurry with air and freeze to produce ice cream. The machine can continuously automatically produce the ice creams with uniform quality. The effective and reasonable compared with the intermittent continuous production and reduce costs, ensure the stability of the fluid quality. The feed liquid of ice cream can be pumped into the Freezing cylinder together with air through the Mixing pump with air-in regulator valve. It is mixed by the mixing scraper and frozen by the cryogen in the entresol. Ice cream frozen on the wall is removed constantly by stainless steel blade on the mixing scraper. Finally the feed liquid forms well-organized ice cream with right overrun under the pressure of the pump and then adjustable constant-pressure valve after it is continuously frozen, scraped and mixed with air. 1. Our Continuous Freezing Machine completely conform to the health standard. The frame, guard plate and the cooling pipeline system of the machine are all made of stainless steel. All the parts contacting the blending materials and the ice cream are made of stainless materials easy to clean and exchange. 2. Body of continue freezer is made by stainless steel. The two sides of machine stainless steel sides removable, facilitate maintenance equipment maintenance personnel of the other parts. 3. Freeze cylinder iinner hard chromium plating and surface finishing grinding surface, achieve the effect of bright and clean, make its ice cream mixture live excellent heat exchanger and effective agitation of effect, put the scraper stainless steel stir scrape a certain speed is continuous healthy freeze cylinder along the inner surface of the rotation, can ensure that production is exquisite, smooth ice cream product, driven by the main motor through the belt transmission to stir the scraping components. 4. Refrigeration system for built-in, seal, spiral type compressor, the use of Freon refrigerants, R502, R22, R404 can be Choice.